Sisko brings his family and Ezri Dax to a remote planet in search of answers about his biological mother. Meanwhile, Kira resists Romulan encroachment on Bajoran land. Oh, and also, Worf wants to get Jadzia into Klingon Heaven. See, Doctor? Right there. That's the part of my character history that needs to be ret-conned. Get painting! Matthew: This episode starts out really strong. It's basically a Dax story, and it's the most interesting one in quite a while. Ezri's predicament, being joined to a symbiont without any plan or preamble, it much more relatable than Jadzia's story ever was. Feeling like she's lost identity and struggles to fit in is a good emotional hook. This is effectively dramatized in her shuttle sickness, hating raktajino, her halting attempts to talk to the crew. All in all, this episode had one big job to do for a fan - to make the departure of Jadzia feel OK, and to sell us on Ezri. I think on this score it succeeds. Kevin: The only real nagging question is that giving the Trill taboo against reassocation, sending her back to literally her old life seems odd. I can see an argument that the chance to resolve or reconnect with Jadzia might smooth the transition, but I wish that had been laid out more clearly. I also think, particularly in regard to the space sickness, it's gets a little too cutesy over the arc of the season. It's like that romcom heroine who runs a bakery and her only character flaw is clumsiness. I kind of wish they had layered some really negative traits, like maybe Curzon's imperiousness or even a hint of Joran's pathology. All of her faults make her more adorable, and it works overall, carried by Nicolle DeBoer, but it nags me a little. I agree that in the four walls of this episode, it is certainly engaging and an interesting introduction to the character. Matthew: The Klingon B story is pretty "meh." There was the solid emotional note of indicating the different characters' motivations for being there, and Worf's irritation with it. But the plot itself was pretty inconsequential. Some shipyard, mentioned by Weyoun and Damar briefly, has to go down. The extraneous characters press a few buttons, but really don't contribute much to the mission. They succeed. Yawn. This feels like a pitch for a larger story, one that would contain 5 or 6 additional scenes that could flesh out some actual drama. Here, it's just a sketch. Which, come to think of it, is a good way to sum up the Roluman C story. There are torpedoes on a moon, which is... bad, I guess, because we're told so, and Kira needs to bluff her way out a tense (so we're told) blockade situation. Which she does. There's just not enough here for me to really care. Kevin: Given Worf's crisis of faith in TNG, I would have liked some discussion of it by Worf, as if he knows he's being irrational but he still can't shake feeling the way he does. It would add some depth to his position. I agree that it should have felt like it would have more impact on the war. I liked the Romulan arc more. I have no problem either objective of subjectively for the Bajorans being so irate. Having just seen Hamilton, I can only think of how differently the Revolutionary War would have ended if the French had tried to establish a permanent military outpost in the United States. I do think it's the Romulan's crazily overplaying their hand. I mean even if the Bajorans back down, it would have to make the Federation question the alliance. I enjoyed the scenes themselves. Steely Resolve Kira is always fun. Matthew: Things kind of go off the rails for me in the last third of the episode, which focuses primarily on Sisko's new retcon history and his prophet visions. So look - I enjoyed "Far Beyond The Stars." But what it is doing here in this story? It is used too briefly to mean anything, and in my view it just bogs down the story with unanswerable questions and diversions. What he hell is this supposed to represent? Sisko's uncertainty? But he wasn't familiar with the history of mid-century pulp sci-fi magazines and race relations... so is it something that the Prophets are actually doing? Sending a sci-fi writer in the 1950s visions of the future, and then sharing them with Sisko in order to... what? The images are interesting - being in a mental hospital, writing on the walls, choosing whether to paint them over or not. But I have no idea what they mean, and I don't think anyone does, really. It's just frustrating, rather than enlightening or exciting. Then we get to the idea that the Prophets possessed and impregnated some lady in order to create The Sisko. Sigh. I get that his demonstrates the Prophets extra-temporal nature. But it all skirts the more interesting questions - why would the Prophets use someone from so far afield of Bajor, the place they're apparently keenly interested in, to effect changes there? Do they have some larger plan for the galaxy, or the universe? It doesn't really seem so. Do they do this in other places, as well? Are they bound to do these things by a block-universe conception of spacetime (i.e. all events have already happened from a perspective outside spacetime, thus they are fated), or do they have radical freedom to break the chains of cause and effect? Kevin: I always thought the best possible solution to Sisko' would be that because the Prophets exist outside of linear time, from their perspective Sisko always was the Emissary, is and would always be the Emissary. I think it would be an interesting twist on the idea of fate and it would have this weird inverse effect on Sisko's status. Sure, he has this awesome position in Bajoran religion, but it's not like he did anything to earn it or continue to keep it. The working in of the Benny story line felt like they just really liked that episode and wanted to revisit it. My issue is there's nothing in Far Beyond the Stars to indicate Pah wraith involvement, so it feels really tacked on here. Other sci-fi and fantasy series have pulled the It's All a Dream idea, with greater effect, too. On their own, the scenes are interesting enough, but it feels too disjointed to be really interesting. Matthew: Nicole DeBoer, in addition to being freaking adorable (I want to put her in a basket of adorables), also conveys the journey of her character pretty well. She is funny but vulnerable, alternates between strength and weakness, and overall turns in a very nice performance that engages me with her character. She did everything she needed to do in her first big show, basically. Kevin: I agree. Whatever wrinkles the Dax story has on paper, the performance is great. More than anything, she's a fully realized character right from the start. Matthew: Avery Brooks was... well, pretty hammy in spots here. I'm sure insane asylum scenes are fun for actors, but they need to make choices as to how much mania they show. Here, the giggling and emoting was just too much, for me. As much as I found the scenes pointless, I really enjoyed Casey Biggs as the asylum Doctor. If ever there were a "no small scenes, only small actors" guy, Biggs is it. Well, Biggs and Jeffrey Combs, right? Kevin: How to phrase this? I think Brooks was hammy, but not outside the lines for Brooks style. I totally agree on Biggs, though. We learned from his convention appearance that he teaches acting, and boy, would I take that class. There's a sweet spot for a 1950s psychiatrist for pompous but condescending and he nailed it. Separately, especially in such an odd setting, it's always fun to see the Siskos interact. Matthew: I thought Michael Dorn did a good job making Worf's motivations identifiable, and I found his interactions with the crew to be illuminating. Speaking of crew Armin Shimerman is often tasked with hard going on DS9, since his character is, shall we say, less than admirable in many ways. Here, I don't think he overcomes it. I found him petulant and snotty. Maybe I've just had my fill of petulant snottiness lately given recent politics. Kevin: The real problem is the story doesn't get enough room to breathe so a lot of the character work feels clipped. I bought Worf's emotional arc, but everyone else was kind of there because the script told them to be. Matthew: Although the sun, shipyard, and flares were really obvious "early" CGI, I thought the scenes were well composed and executed given the constraints of the time. It was a suitably large-looking and dramatic flare, and it consumed the shipyard in an interesting way. Kevin: I remember liking it a lot, particularly the shearing off of bits of the ships in the yard ahead of the explosion. The whole sequence reminded me pleasantly of the Amargosa scene in Generations. 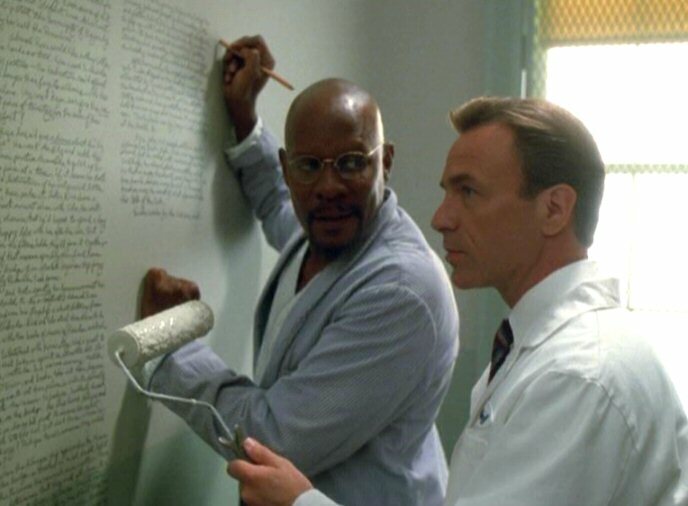 Matthew: I liked the look of the asylum set, and the writing on the wall was done very well. The desert scenes were clearly Planet California, and although they looked nice enough, I wish they had done something to the image to make it look more alien - just a color filter over the camera would be enough. Kevin: The writing was a nice touch and I'm sure some intern spent a lot of time on it. I don't mind the desert planet set. I kind of dig the desert gear and want a set as a pajama/robe combo. Matthew: This episode is a mess. It's got some parts that work very well and others that feel slap-dash and rushed. It ends on a bad note - a prophet vision (almost always the death of enjoyment) and a head-scratching retcon. I think, on balance, it's probably a 3. There is narrative momentum at least. But this scattershot storytelling approach has really worn thin with me. When you get above the letter C with your story threads, I start to wonder why you didn't better focus your script so that A and B could breathe. Kevin: I agree with the three. It's definitely uneven, but it also definitely held my interest throughout. The Worf story could have been jettisoned and given its own episode. The Prophet stuff is shaky as well. Still, between some good Sisko family dynamics and some good tense standoffs, this falls at least in average territory. That's a total of a 6.